Leave Boston behind and visit two iconic New England destinations, Plymouth and Cape Cod, during this full-day tour. With a small group of 14 or less, stop at both the Plimoth Plantation and the Heritage Museum and Gardens to learn more about the history of this area. Hotel pickup and drop-off is included from select hotels in Boston with a professional guide. Begin your day with early hotel pickup by around 7:45am in Boston in an air-conditioned minicoach that seats up to 14 travelers. Your professional guide will lead you over the widest sea level canal, Cape Cod Canal, on your way to Cape Cod's oldest town, Sandwich. Muffins and bottled water will be provided, and chips in the afternoon. Spend time in downtown Sandwich before you head to the Heritage Museum and Gardens or Sandwich Glass Museum. Explore some of the most beautiful grounds, that include an American Antique Auto Museum, an American Folk Art collection, and a 1919 working Carousel. Next, you can enjoy a discounted turkey dinner at the home of the First Thanksgiving, Plymouth (own expense). 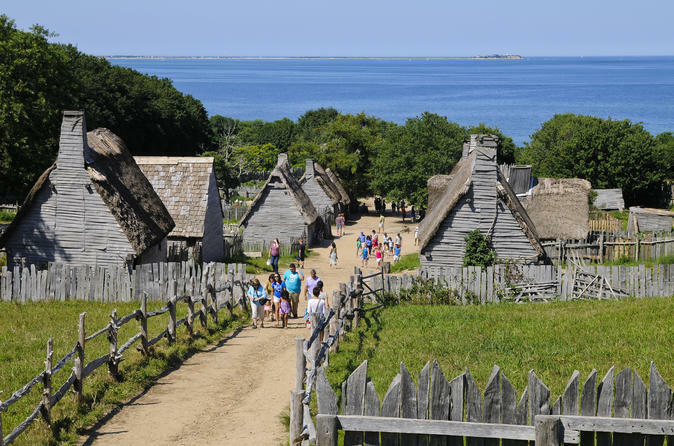 Step back in time to the 17th century as you visit the Plimoth Plantation's living museum. Stop at Plymouth Harbor to see Plymouth Rock and enjoy some free time shopping or taking in the views. End your tour with a visit to the National Monument to the Forefathers. This is thought to be the largest solid granite monument in the world. You will arrive back in Boston around 7pm.